When news about the Supreme Court’s decision to remove Chief Justice Maria Lourdes Sereno reached students yesterday, they didn’t at all take it easy. In an en banc session on May 11, the Supreme court voted 8-6 in favor of approving the quo warranto petition against the chief magistrate. Sereno is the first constitutionally installed officer who was removed from office without an impeachment trial. In decentralized protests led by students from the University of the Philippines Manila, Polytechnic University of the Philippines Manila, University of the Philippines Diliman, Ateneo de Manila University, and University of Santo Tomas, groups condemned the dismissal of checks and balances in the government and the possibility of martial law in the country. 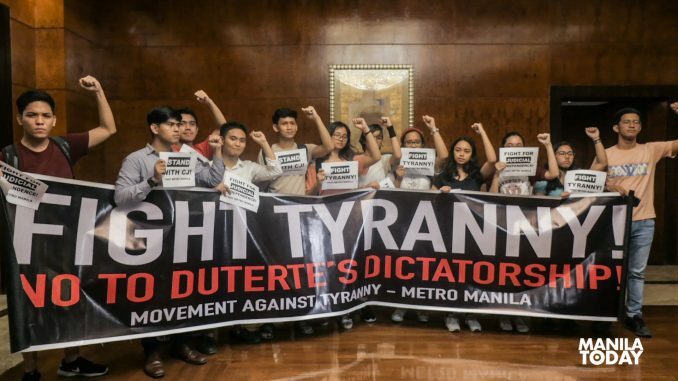 “Well-orchestrated at nagtagumpay ang rehimeng Duterte para tanggalin sa isa sa mga balakid sa kanyang pamumuno sa bansa, lalo na sa kanyang mga anti-mamamayang polisiya,” said Youth Movement Against Tyranny representative Paco Perez. Perez also noted the youth movement’s role in defending democracy then and now. 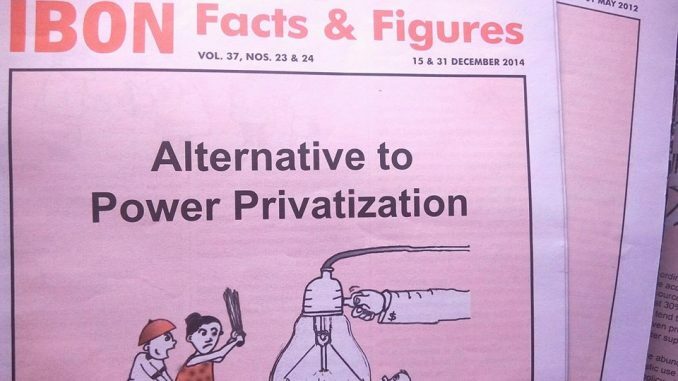 “Noong si Marcos ang nakaupo, ang Kabataang Makabayan ang pinakamalaki niyang kalaban. 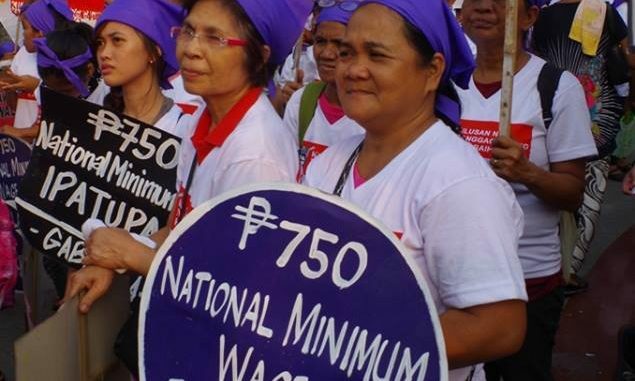 Marami nang nagtangka na magpataw ng diktadurya sa bansa, at kailanman hindi sila nagtagumpay dahil kaisa ng kabataan ang mamamayan. Sila ang magiging balakid sa diktadurya ni Duterte,” he added. 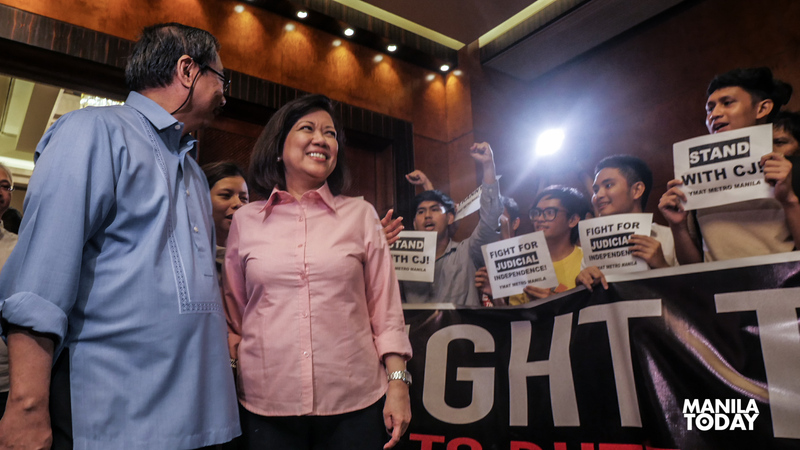 Students from different universities also showed their support for Sereno after she held a press conference at the AG New World Manila Bay Hotel in Manila. In the quo warranto petition filed by Solicitor General Jose Calida, Calida justifies Sereno’s non-qualification as Chief Justice due to her failure to submit a complete statement of assets, liabilities, and net worth (SALN). Sereno came under fire after citing errors in Duterte’s “narco list” in 2016 and for voting against the extension of martial law in Mindanao. Photos by Psalm Calienta, Marisse Bunag, Maria Mercedes Mendez, Sarah de Leon, and Erika Cruz. 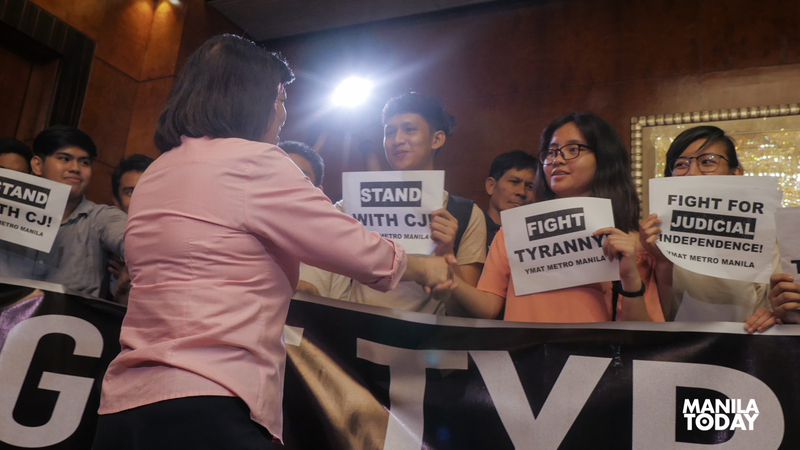 The post IN PHOTOS: Students hold protests across Metro Manila vs CJ Sereno ouster appeared first on Manila Today.